Finally we come to aperture. This is the most important corner of the exposure triangle, in terms of creative control. Sadly, it is also the most complicated to understand. The aperture is the opening is in the front of the camera and the aperture value describes how big that opening is. The larger that opening, the more light gets to the sensor/film. That’s the simple part. The tricky part of aperture is how they chose to label the different settings. Unlike shutter speed, where the numbers represent an actual measurement, the numbers for aperture use the relationship between one actual number and another number to represent the real number in which we are interested, which would be the size of that circular opening behind the glass of your lens. However, the numbers we do use can be a bit confusing if you are trying to think about them in terms of stops, of one amount of light being double or half of another. Aperture values do not appear to work in a logical way, but there is a reason for this. You remember what I told you about the old film speed system, DIN, invented by the Germans? Well, aperture values go back to the days when photography was not the domain of Japanese industrial giants, but of German industrial giants. Like the DIN system, our system aperture values was apparently invented by someone with a head for math and a sadistic hatred for the human race. Sounds like a German to me. 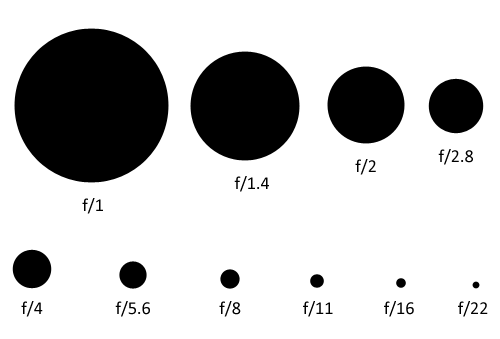 First of all, aperture values go from the smallest numbers, which represent the largest aperture (and the most light) to the largest number, which represents the smallest aperture (and the least amount of light). Secondly, the numbers themselves are not linear, at least not in a way that makes sense to normal people. It might make sense to the kind of people who did well in high school geometry, but only back when they were actually doing well in high school geometry. To illustrate the problem, here are the standard aperture values, in use ever since Adam and Eve were posting naked selfies from the Garden of Eden. No one would blame you for looking at that and thinking that an aperture value of f/2 would logically be one stop more or less than f/4, because two is half of four. As you might have guessed, this is not the case. Each aperture value in the table above is one stop more or less than the ones next to it. In other words, f/2.8 is one stop smaller than f/2, letting in half as much light, and one stop larger than f/4, letting in twice as much light. As you can see in the image above, an f/1.4 aperture is always about 40% wider than f/2, but with exactly twice the area. The same applies all the way down the line.